This film is very powerful. It has both horrified me and brought me peace. It has enlightened me as well as wholly discomfitted me. It is quite appropriate that The Messenger offers an important message in and of itself. It sheds light on our own conscience. It questions morality as well as its interpretation. It also forces us to contemplate our relationship and/or connection with God. Granted, not everyone will be so moved by this film. There will be many who view it as silly, superficial, and "a nice try at producing another Braveheart." But as for myself, I was quite touched. And this is all the more astonishing when I recall the attitude that I had going in to the theater. I wanted to find fault with this movie. I wanted to be able to provide a good critique of the movie so that it would not always seem (as is often the case, I am told) that I am too generous in my ratings and reviews. And at first, I did have a somewhat cynical view of the movie. My complaints would have been: "Too artistic." (There is much vivid, dreamlike imagery used throughout the film.) "Too simplistic." "Too predictable." (The premise of the movie seems at first to be laid out in the very beginning of the movie...It seems to be.) There were also many troubling aspects as to the film's contents. Especially the whole idea of God being on one side of a war and of a young girl championing death and massacre in His name. But the truth of the matter is that the movie's wonderful and climactic ending turned everything upside down as well as place the pieces of the intricate puzzle suddenly into place. 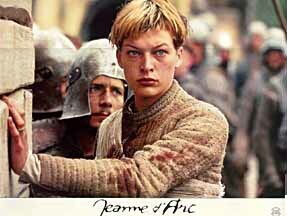 And the one who really changed my heart about the film was the main character, Joan of Arc. She was portrayed by Milla Jovovich, who in my mind deserves an Academy Award for her breathtaking performance. Her eyes (just look at them to your left), the way she breathed, and the way she pleaded for others to hear her "message," were simply captivating. She made me feel her struggle, her fears, and her tirelessness. And at the same time I felt like an observer of someone extraordinary (divine perhaps) and of whom I could never completely know and understand. And yet, by the end of the film, I felt like I did know her and that she was, perhaps, a part of myself, which now she certainly is. 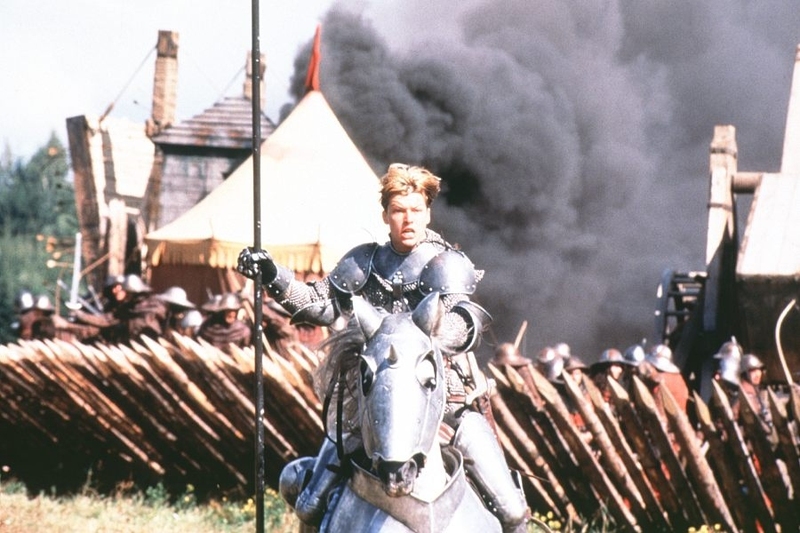 I now realize that part of my praise of this film, and of others like it (Braveheart, Dragon: The Bruce Lee Story, Quiz Show) is that it features one man (or woman, in this case) facing terrific odds and who sometimes feels deserted in their struggle. The impetus of this struggle is something greater than the protagonist's own life and he (or she) will not, cannot, turn away from it, even though they will be deserted or persecuted by others and even their own conscience. This type of theme resonates within my soul. I was a bit confused as to just who Dustin Hoffman was supposed to be. Was it God? He seemed to be able to pass judgement on her. Was it Satan? He seemed to tantalize her and torture her mentally. This dark, cloaked figure. Who was he? No answer could I find to this question, for no hypothesis seemed to fit. The movie ended and still I had no answer. The ending so affected me that I was unable to move. I watched the credits scroll by as I love to do after a great movie. I sat and took it all in. I tried to comprehend what I had just witnessed. Then I read Hoffman's character name. He is "The Conscience." As I read the words everything made sense. "I did that myself," says the actress. "It was so much better because Luc was filming me, and we have a very special connection when we work together. I looked straight into his eyes as I was falling." One actor to watch out for in future films is Desmond Harrington. This was, to my knowledge, his first feature film and I was extremely impressed with him here as Aulon, the man ordered by Charles VII to serve and protect France's heroine. And the rest of the cast was superb as well. 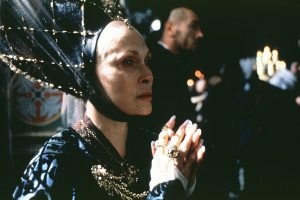 Faye Dunaway (left) as Yolande D'Aragon, King Charles VII's (John Malkovich, a personal favorite of mine) mother-in-law and most persuasive advisor was stunning, wise, and yet somehow tainted. Unfortunately, she was given very little screen time. I also enjoyed seeing Tch�ky Karyo be able to appear in a much better movie (and role) than his latest flop, Wing Commander. And there were many more contributing heavily to the success of this film (including over 1500 extras for the battle scenes). However, there were a couple of things that distracted me from being completely taken in by the spell of the film. Most of this occurred in the genesis and was later made up for by a terrific ending. First and foremost was the little girl, presented to us as the young, 9-year-old, Jeanne. He demeanor seemed too orchestrated. She was a fine young little actress, but I believe that she was just asked to do the wrong things by her director (Besson) to bring her character to life. I also felt that some of the scenes featuring animals blatantly revealed that this was a movie and not real life. I refer mainly to the "wild" dogs and wolves of whom I could tell were quite domesticated just by the gentle and obedient looks in their eyes. Now granted, to get a dog to "act" by changing its demeanor is something of an impossibility, but I have seen it done in many other movies. Also, whenever they (or the ravens) would feast on human remains, the human remains seemed quite fake. The thing that stood out the most though was the colorful maps that the French generals would look at before planning out each battle. C'mon. Color maps? In 1430? But nothing, not even a few glitches here and there, could take away from the power of the films ending. It, of course, ends with Jeanne being burned at the stake for heresy. NO! I didn't spoil it for you! This is based on an actual historical figure, remember? What was perhaps most intriguing (and is perhaps The Messenger's most powerful message) is that, in the end, Jeanne is not a saint, a legend, or an angel. She is a human being, encompassing all of the human qualities of sin, imperfection, self-doubt, and mortality. The horror and gravity of the burning are captured perfectly. We are tormented along with her and seem to feel a portion of her indescribable pain, yet gentle peace. And then as the shocking visions and pounding music get our hearts thundering loudly, they (our hearts) are the only sound that can be heard as a massively thick silence pervades the theater. Not a soul stirred in the packed house as the few words of the epilogue appeared on the dark, black screen. Finally, as the credits began to roll, one by one people began to find the strength in their bodies to move about. It took me a bit longer. I was the last one to leave. This movie will shock you and inspire you. It has an unmistakable similarity to Braveheart. So if you liked it, then you may love this one as well. 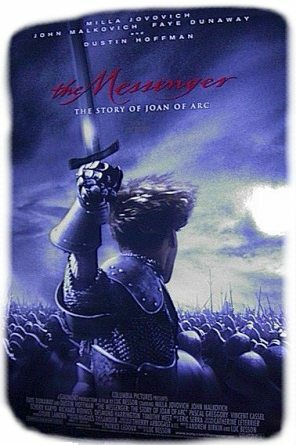 How would you rate the movie The Messenger: The Story of Joan of Arc? There have been 22627 people to visit this page since Fri, Nov 12, 1999. And you are the first person to visit this page today!